Well, it’s not just about how much precipitation arrives in a year, but when the precipitation arrives and in what form. We certainly don’t need to worry about a dust bowl blowing across New England, but there is genuine concern about late-growing season moisture stress increasingly occurring in many species in our northern forests. There doesn’t have to be an outright drought for moisture-loving trees to feel the pinch if they’re getting less water than they need. 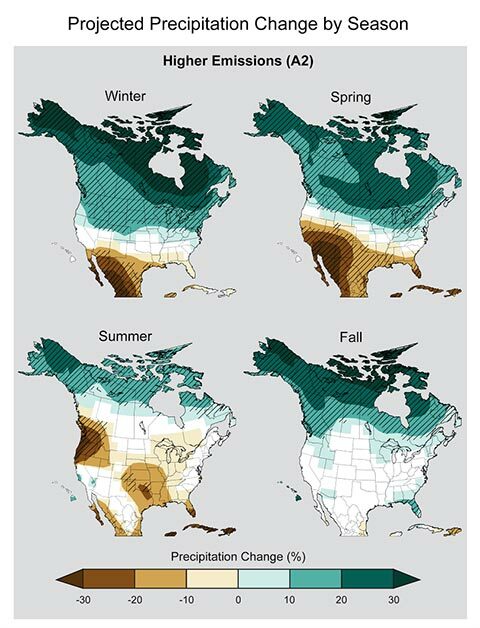 A recent Comprehensive Science Synthesis of Drought Impacts on U.S. Forests details long-term observations of warmer temperatures and changing rainfall patterns, and projects how these climate conditions are anticipated to continue changing throughout the country. 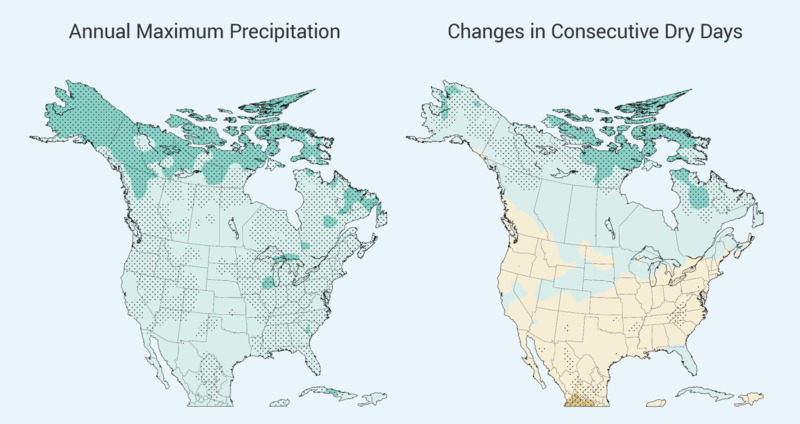 An important point in the Northeast and Midwest is that we are getting more rainfall, but more of our precipitation is coming in torrential rain events that don’t necessarily provide moisture at the right time for plants. It turns out that warmer temps and changing rainfall, not necessarily less rainfall annually, are two key ingredients for drought and moisture stress. More extreme precipitation events, longer duration between events, and shifting seasonality of precipitation will likely increase the frequency of drought occurrences and moisture stress over the next century. Drought can come in many forms and is projected to occur more frequently as short duration hot droughts. Short duration hot droughts can be forest altering, inducing stress on trees which reduce growth and decrease forest health. Northern forest moisture limitations may favor drought tolerant species such as pines and oaks as time passes; over the next century climate projections describe a shift in tree habitats for many species, which may move northward or to higher elevations. Although management options for the regions’ forests will vary based on the vulnerability of a particular ecosystem to moisture stress, drought-adaptive strategies can include reducing competition for limited soil moisture, increasing forest species diversity, altering stand density, leaving harvest residues, and favoring species that enjoy dry spells. Climate change may bring new opportunities, but also new risks – these may not alter our decisions, but it never hurts to be informed.